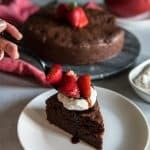 A dense, rich cake hiding a very subtle veggie secret: pairing this Chocolate Beet Cake with balsamic-macerated strawberries and whipped Mascarpone might just be the best dessert decision ever made. Spray an 8-inch springform cake pan with baking spray, then line the base with a round piece of parchment. Preheat oven to 350 degrees F.
Sift together the flour, baking powder and cocoa. Set aside. Place the egg whites in a large mixing bowl and place it in the refrigerator. Whisk the yolks together in a separate bowl. Set aside. Process the steamed beets in a blender or food processor to a coarse purée. In a small bowl set over a pot of simmering water, melt the chopped chocolate. When it is almost melted, pour in the hot coffee over it and stir a few strokes. Add the chopped butter to the melted chocolate and stir, then allow it to soften. When the butter has mostly melted, stir to combine and add the vanilla. Allow to cool for a few minutes, then quickly stir in the egg yolks so they blend evenly. Fold in the beets. Whip the egg whites with a hand mixer until soft peaks form, then slowly add the sugar in a stream while mixing. Whip to stiff peaks, then fold into the chocolate mixture with a rubber spatula. Fold in the flour and cocoa until just incorporated. Pour the batter into the prepared cake pan. After placing it in the oven, decreasing the heat to 325 degrees F; bake for 35-40 minutes, or until moist crumbs cling to a toothpick inserted in the center. Set the cake on a rack to cool completely, then remove from the pan. Combine vinegar, 1 tablespoon sugar, and lemon juice in heavy small saucepan set over medium heat. Whisk until sugar dissolves; bring to a boil for 3-4 minutes, allowing syrup to reduce to about 1/4 cup. Transfer to a small bowl and allow to cool completely. Combine strawberries and remaining sugar in large bowl. Drizzle with balsamic glaze and toss to blend. Let stand 30 minutes, stirring occasionally. Combine mascarpone, heavy cream, vanilla, and sugar in medium bowl. Whip until soft peaks form. Cover and refrigerate until ready to use. Top slices of cake with whipped Mascarpone and balsamic berries.